Halo Infinite - the conference started off with this announcement and demonstration of 343's new game engine, titled the "Slipspace Engine." Outside of stinging that Halo music we've all come to know (and love? ), and a some behind-the-back Master Chief shots, not much else was said about the game. It's safe to say that it will have co-op similar to the past titles, but we'll have to wait a little while longer before we get more details on that. Forza Horizon 4 - hey, do you like racing/driving cars? Do you like racing/driving them through the English countryside? Ok, but do you still like doing that when the seasons change? If the answer to all of those questions is "YES!" then Forza Horizon 4 is the game for you! The next entry in the Forza Horizon series will be coming to Windows 10 and Xbox One on October 2, 2018. The big changes this time will be the dynamically changing seasons that will allow players to access new areas ("see that frozen lake? you can drive across it! "), and a big open-world that will be populated with players so you can team up anytime. We're unsure how many friends total will be supported, but there is co-op and it will likely be similar to Forza Horizon 3. The Division 2 - we'll undoubtedly hear more about this sequel tomorrow during Ubisoft's press conference, but Microsoft got to show this off first. In a trailer that felt a little too on the nose, agents of the titular Division will be headed to Washington, D.C. Not a lot of details about how the game will differ from the first outside of that, but the gameplay footage showed off some shooting and looting and four player co-op, so that's good. There's a beta sign-up right now, and the game will be out on March 15, 2019 on the PC, PlayStation 4, and Xbox One. Cuphead DLC, "The Delicious Last Course" - the DLC will add a new island with new weapons, new bosses, new charms, and a new playable character, Ms. Chalice. No price point or firm release date, but it'll be out sometime 2019. Dying Light 2 - more zombie parkour! Not a lot of details here, but Chris Avellone is involved in the story direction and players will be have choices to make as a part of that story. In the brief bit they showed, one choice put the city into a police state, or a wretched hive of scum and villainy. Hopefully it will be a little more diverse than that. No word on the co-op, so we're assuming that it will support four player online again, but the fact that player choice is so important, it'll be interesting to see how that translates into what carries over from host session into friends' games. This will be coming to Xbox One, PC, and PlayStation 4. Battletoads - they're back? They're back. Yay? This was just a short teaser that announced the game coming out in 2019, but out of everything shown/revealed, they had the decency to state in a very clear bullet point "3 player couch co-op." YAY! Crackdown 3 - Nick covered most of what was shown in an earlier post, pretty much not a lot to say here other than the fact that it has a February 22, 2019 release date. And a lot of Terry Crews, which I'm totally good with. Gears 5 - Nick covered this, too, but the next entry in the Gears of War franchise is apparently dropping the "Of War" and also focusing on Kait Diaz from the previous title instead of JD and Marcus Fenix. Sounds good to me. Don't know what additional game modes there will be, but couch and online co-op will be supported. This will be a Windows 10 and Xbox One exclusive title. That about covers it on the co-op front from the Microsoft conference. 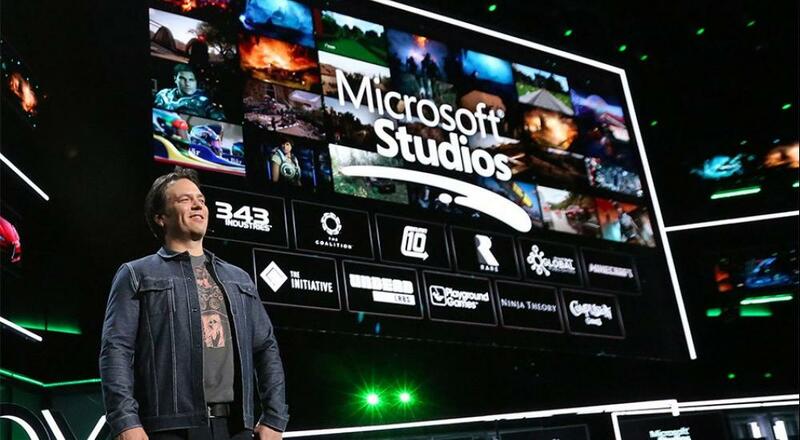 There were a number of games that flashed by quickly when they did their "here are some titles coming to ID@Xbox" thing, but didn't get a lot about any of them, so we'll likely have some more info about those once E3 kicks off proper on Tuesday. Bethesda's conference is underway as this post goes live, and while there hasn't been much in the way of co-op from them, there's still time. Hear that Bethesda! You can still do co-op!